Sky's The Limit: Tom McCalmont's REGrid Power now offers a financing program that allows homeowners to get into solar power without a huge upfront expense. IT USED to be that only the wealthiest of environmentally conscious folks could afford to shell out the cash to bring solar power to their homes. But that's not so anymore. Some San Jose residents have discovered that they no longer have to pony up for a huge solar-power system in order to do their part for the environment. Several Silicon Valley solar companies are now offering programs that allow homeowners to lease or finance solar power—and save money on their power bills from day one. The emergence of "green financing" firms makes it possible for these solar companies to offer low-cost programs to residents. The option for customers to lease or buy a solar-power system and pay it off over 25 years is a huge breakthrough for residents who haven't had enough cash to go green. The initial cost of a solar system is as high as $40,000. While there are state rebates or federal tax credits available, residents often have to wait several months to take advantage of them. For many, solar hasn't been worth the trouble. The new green-finance programs couldn't come at a better time. There's a growing desire among consumers for cheaper and cleaner power. A recent survey conducted by the Public Policy Institute of California showed that 54 percent of Californians believe global warming poses a very serious threat to the state's future economy and quality of life. At the same time, they are worried about record-high fuel prices and a lingering recession. "We all want to adopt clean power," says Lyndon Rive, CEO of the Foster City–based SolarCity, "but not at the cost of an arm and a leg." Policymakers also continue to work to help make alternative energy cheaper. California lawmakers have worked to cut the cost for residents and businesses to install solar by offering generous rebates. And several California cities—including San Jose—have lowered the price of solar permits, which can be several hundred dollars. Maybe these efforts are paying off, as the state continues to see an upsurge in solar installations. In 1997, there were only 95 solar power interconnections statewide. By 2007, there were more than 32,000 interconnections, according to the California Energy Commission. Last year California accounted for more than 50 percent of the U.S. solar connections, according to Pacific Gas and Electric Co. It's primarily commercial businesses that have tapped into solar power—in part because they receive greater tax benefits than homeowners. The federal government has capped tax credits for homeowners who install solar power at $2,000. Much more generous tax breaks are available to commercial businesses that go solar—as much as 30 percent of the cost of the system. As residents watch their electric bills rise, industry leaders are making a bigger push for Congress to remove that tax cap and let homeowners get a bigger break for solar-powering their homes. At this point, Congress is still battling over renewing the tax credits for the wind and solar industry (Republicans and Democrats can't agree on how to pay for them). "We need a lot of government help for the average Joe to get in on this market," says Keith Stokes, a San Jose resident who has been shopping around for solar power for his home. Nobody knows that better than San Jose Mayor Chuck Reed, who surprised everyone, including his own staff, when he took the center stage at the California Clean Tech conference in April and matter-of-factly posed a challenge to the solar industry: Make it possible for San Jose residents to install solar power at no cost. He gave companies 60 days to respond. Then he left the stage. "We didn't talk about it or plan it," says Jeff Janssen, the mayor's senior policy adviser, who worked on the mayor's green vision plan. "The next day, we started making phone calls to solar companies." Of course, the mayor's challenge did not come entirely out of the blue. He had his own challenge to meet: As part of Gov. Arnold Schwarzenegger's statewide mandate, San Jose must install 100,000 solar rooftops in the next 15 years. Reed determined that the only way that would happen is if he could remove the cost barrier. "It's something we need to do," says Jim Petersen, president of PetersenDean Roofing, a Newark-based company. "It's come time that homeowners really do take matters into their own hands." But it was no coincidence that Reed threw out that challenge at the same time that SolarCity was packaging together a solar leasing program to offer residents. The company's CEO had met with the mayor before the conference to talk about solar options for homeowners. It was there that SolarCity's Rive told the mayor about the potential leasing program. "The mayor said, 'That's interesting,'" Rive said. "Then that evening the mayor announced the challenge to the solar industry." Reed certainly upped the ante when he asked solar firms to come up with ways that would allow residents to install solar power without paying the upfront cost so they would not have to wait 12 years before experiencing a savings. It worked. Within a few weeks, eight of the region's most prominent solar companies had put together leasing and financing packages that caught the attention of homeowners in San Jose. SolarCity is offering a 0 percent leasing option through the end of July for homeowners whose electric bill is at least $150 per month. After that, homeowners can still lease solar systems, paying only $1,000–$2,000 upfront. It works like this: SolarCity will be operating and maintaining the solar systems it leases out to its customers. Leasing out the solar systems allows the company to get the 30 percent federal tax break. At REgrid Power they are offering a solar loan option over a 15-, 20- or 25-year term. It guarantees that people's solar bill will be less than their current electric bill. So if they are paying $100 monthly for electricity, they can save $20 or more with the solar financing program, said Tom McCalmont, CEO of REgrid Power, which is based in Campbell. "The phones are ringing off the hook; people are very interested in this idea," McCalmont said. "This is a way for someone to have solar that's economically attractive." Solar companies were invited to the mayor's energy fair in early May held under the City Hall rotunda. Representatives from the green-power companies set up tables and handed out information packets on their financing and leasing programs. Dozens of residents trickled in and out of the rotunda throughout the day. It was such a relief for Sean Michael, a self-described environmentalist who has been eager to tap into alternative energy for the last few years. Michael wanted to take advantage of his windy Alviso neighborhood and install a windmill at his house. But he was discouraged when the wind-power company gave him an estimate that showed he wouldn't really be saving that much. So when Michael heard about the mayor's solar fair, he was intrigued. Michael says it's just these types of programs that need to happen if we are going to fight global warming. "It's a real shift in the paradigm about what green means," Michael says. "It has to be so it's not just financially viable for people who have money." It was Gov. Arnold Schwarzenegger's global warming bill that shifted the stage for the alternative energy and green building industry. The bill, which was signed into law in 2006, called for reducing greenhouse gas emissions by 25 percent by 2020. It also called for 1 million solar rooftops by 2018. These aggressive mandates put pressure on local cities and counties to consider their own green building and energy reducing policies. 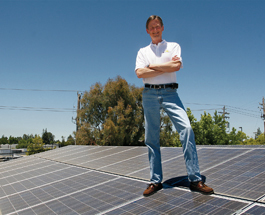 Seeing that Silicon Valley was the booming epicenter of solar technology and innovation, Reed went ahead with his own aggressive green vision, which includes getting San Jose to reduce its energy use by 50 percent per capita over 15 years as well as considering green building mandates for private developments. The Green Vision plan sailed through the City Council earlier this year. Berkeley became the first city to come up with a plan that would cut the upfront cost of solar. Last year, the city approved a solar assessment district, where the city would essentially finance the cost of solar panels for homeowners who would then pay it back over 20 years through property assessments. San Jose is now looking to use Berkeley as a blueprint for its own solar assessment district. It would require a change to the city charter as well as floating a bond to help pay for the solar panels, city officials said. The way it would work is that property owners who want to install solar panels would draw money from the bond and would pay it off over a 20-year period through a property assessment. But it could be another year before the city even considers implementing solar assessments in San Jose. "There are ways for cities to provide even more incentives to encourage solar companies and investors to put up the initial capital that allows people to pay for solar over a life cycle as opposed to paying for the upfront significant cost," said Douglas White, a San Jose–based green building consultant. "Solar is unapproachable now for your average resident, and these programs are helping."